As I walk past the vines, the sweet smell of Concord grapes alert me that it is time to harvest. When I bring my bounty home and get ready to prepare some grapey goodness, I ask my hubby which recipe he prefers; jelly, jam, puree for pie, juice… “Grape juice, grandma’s way”, he replies. It is important for me to not only preserve our harvest, but preserve those memories he has of the farm. My husband is fond of anything done the way they did it on the farm. So, without delay and without an actual recipe from grandma, I begin. Now, mind you, my husband does not cook or follow recipes. I’m going off of stories he recollects from childhood, and for a man who doesn’t cook he does remember the steps pretty good. The process is very simple and I’m going to experiment with the amounts of sugar, because I don’t have the actual recipe from Grandma Bossler. I made some of the jars with ½ Cup sugar and others with 1/3 Cup sugar. I will label them and we shall see at the time of the taste test. Soak and rinse concord grapes in cool water, then drain. I like to add some vinegar to the water and let them soak for at least 3 minutes before rinsing and draining. While they are soaking you can set up your canning assembly line and wash canning jars. After washing the jars in soap and water, I place them in the dishwasher on the sanitize cycle to sterilize. Remove stems from each individual grape and place into a container for later… depending on how many grapes you have this could be a while. Fill each sterilized jar with 1 Cup of Concord grapes. Add sugar to each jar then fill to the rim with boiling water. Remove lids and rings from hot water bath and place on jars for canning. Process jars for 15 minutes in a hot water bath. Because I didn’t have a recipe I used the Ball Blue Book Guide to Preserving for a reference on how long to process my jars. 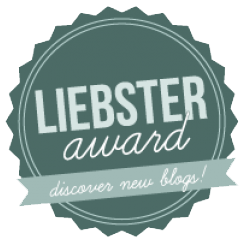 This is a great resource and canning companion! Once the jars are processed and cooled, make sure they have sealed properly. Label and set aside for at least 4-6 weeks while the magic happens. When you’re ready to have your Concord Grape juice – Grandma’s Way, strain juice and enjoy the grapey goodness! Of Course I Can, and you can too! This is only my second summer of canning and with each recipe I learn how to be more efficient and comfortable with preserving our farm bounty. There are many helpful tutorials online and I use the Ball Blue Book – Guide to Preserving as my go-to kitchen reference for all things canning. The most important step to remember is following the sanitary and processing guidelines. Safety first! It has been a busy summer and I have learned so much from my apprenticeship at Riverbend Roots Farm. The team I work with are more like family then coworkers and I hate the idea of leaving them. My bosses Kris and Stacy are amazing farmers who share a passion for bringing naturally grown farm fresh produce to customers, as well as, sharing their knowledge with aspiring farmers-in-training. I am so lucky I have had this opportunity to learn from the best. I’ve been applying what I learn to our farm and have had a successful harvest this season. I’m eager to move forward on a larger scale next year as I follow my farmDREAM. I love the fresh goodies provided during the farm season, but what about when the weather turns cold? Well, canning and preserving will give me a taste of summer harvest throughout the winter. This year I decided it was long overdue to can salsa. This recipe is my first attempt and I’ve been receiving positive feedback thus far. I use what’s available at the farm and have noted the measurements that appeal to us, but if you prefer more or less of something make the adjustments and you will have great salsa every time! The best thing about any recipe is that you can make it your own. *Acidity is needed for canning. You can also use lemon juice or cider vinegar but I find lime juice has the best taste for salsa. *based on your taste you can add 1-2 Cups of fresh cilantro. I use 2 cups when cooking my recipe because we love cilantro! 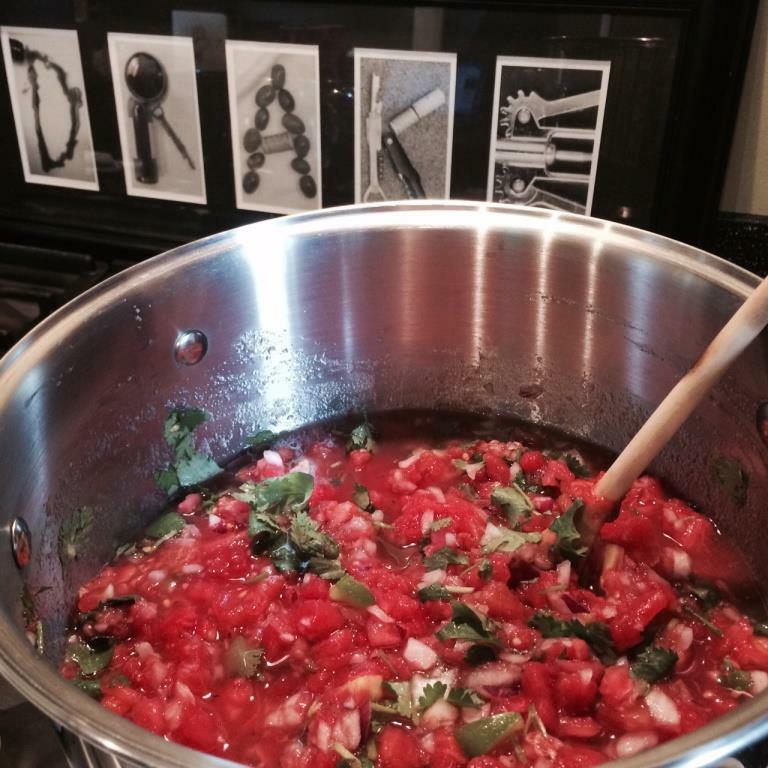 In addition I chop ½ cup fresh cilantro and mix into salsa before serving. 1. 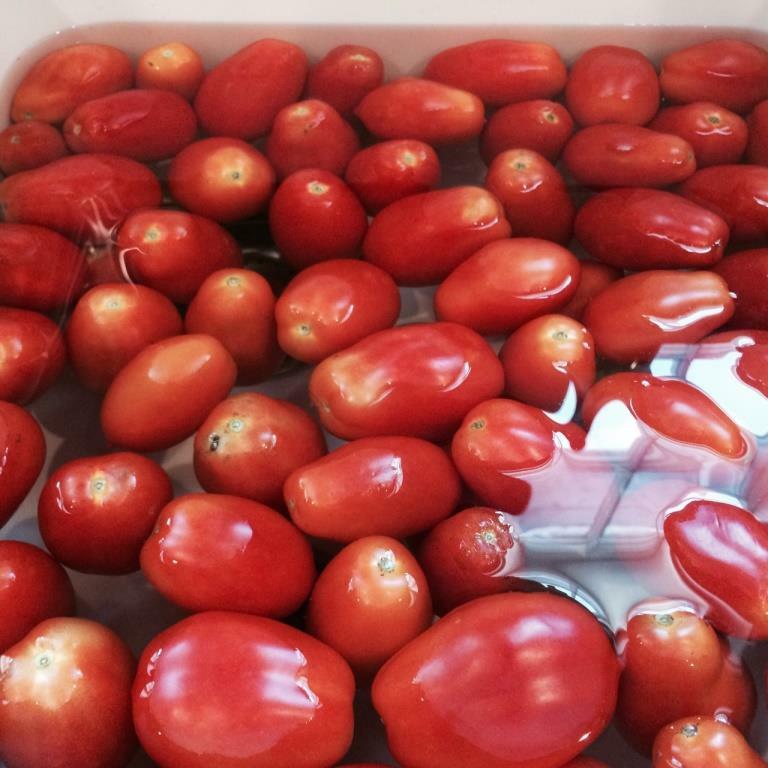 Place whole tomatoes in a pot of boiling water for 30 seconds and then immediately remove and place them into an ice water bath. Remove from the water and easily peel skins. 2. Dice tomatoes and remove seeds. After measuring 10 Cups of tomatoes I pour into a strainer to remove excess water. 3. Remove seeds and veins from jalapeno peppers. If you like your salsa hot you can leave some of the seeds and veins intact. Chop peppers, onions, garlic and cilantro. 4. Add all ingredients into a large stock pot. Add seasoning; lime juice, ground cumin, salt and pepper to taste. Bring all ingredients to a simmer and allow to cook for 18 minutes. Sanitize glass jars, rims, and lids in hot water bath for use. 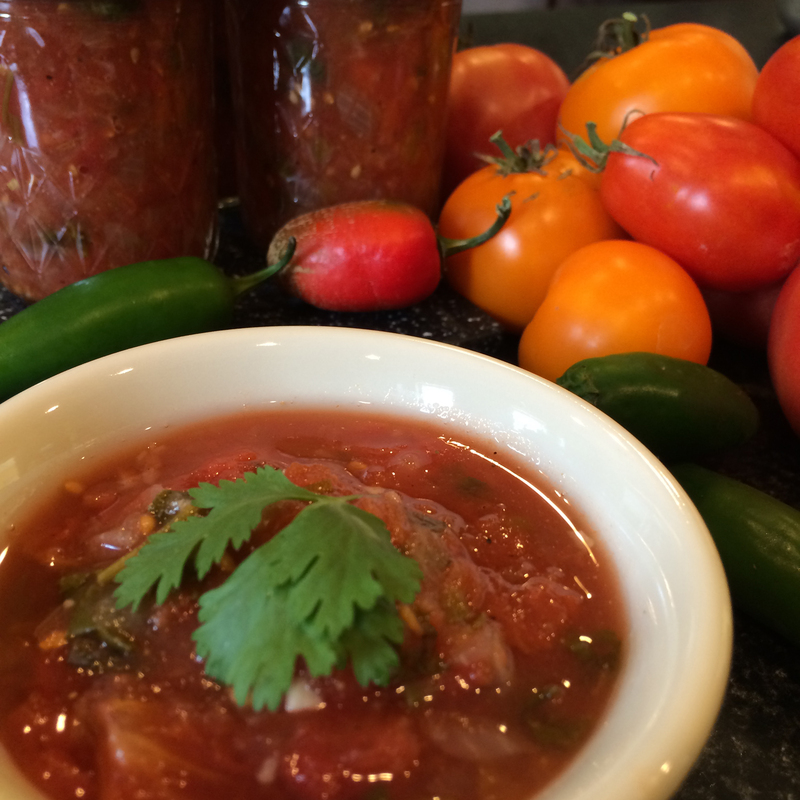 Once your salsa has been cooked pour the hot batch into sanitized jars and twist lids tightly. Process jars in a boiling water canner for 15 minutes. Once jars have cooled check center of lid and make sure the safety seal does not pop. If there are any jars that did not properly seal you can place in the fridge and use right away. You can also freeze the salsa. I use what’s available at the farm and have noted the measurements that appeal to us, but if you prefer more or less of something make the adjustments and you will have great salsa every time!